On April 5, the Center for Universal Education hosted its annual research and policy symposium on the global movement toward recognizing breadth of skills within education systems, as detailed in this report. You can watch video from the event or listen to audio here and share your thoughts using #BreadthofSkills. In the Skills for a Changing World project, we are exploring the new demands placed on education in the 21st century and how education systems are responding to them. There have been increased calls globally for students to develop a broader set of skills during the years of formal education than in the past. Education has typically been seen as a preparation for adulthood and its work-related responsibilities. Recently, however, the focus on academic, vocational, and technical skills (e.g., Brewer, 2013) has shifted toward an aspiration for education to inform both work and life more generally (e.g., Pellegrino and Hilton, 2012). Many frameworks describe the skills or competencies that this 21st century world demands (e.g., Binkley et al., 2012; Lippman, Ryberg, Carney, and Moore, 2015), and in so doing, they display strong commonalities. The frameworks examine what competencies people need to function effectively in society, with descriptions varying from very high level (e.g., Delors, 1996) to very detailed (e.g., Binkley et al., 2012). Differences also emerge primarily in the degree to which skills or competencies alone are identified or whether a wider range of human characteristics are included. The adoption of the Sustainable Development Goals (United Nations, 2016) acknowledges this shift in the focus of education toward a broader approach. Of particular interest for Skills for a Changing World, Sustainable Development Goal 4 calls for skills beyond literacy and numeracy—including readiness for primary education (4.2), technical and vocational skills (4.4), and skills needed to promote global citizenship and sustainable development (4.7). These targets signal an emphasis on the breadth of skills necessary to prepare children, youth, and adults comprehensively for 21st century citizenship and life. Notwithstanding the strong endorsement of the need for a broader range of skills by global and regional organizations and by individual countries (e.g., Care and Luo, 2016; Reimers and Chung, 2016), there is considerable variation in how national stakeholders are responding. This Skills for a Changing World: National Perspectives and the Global Movement report summarizes country-level responses based on a public scan of education systems and discusses country-level stakeholder views on the skills students need for today and tomorrow in four countries: Mexico, South Africa, Kenya, and the Philippines. 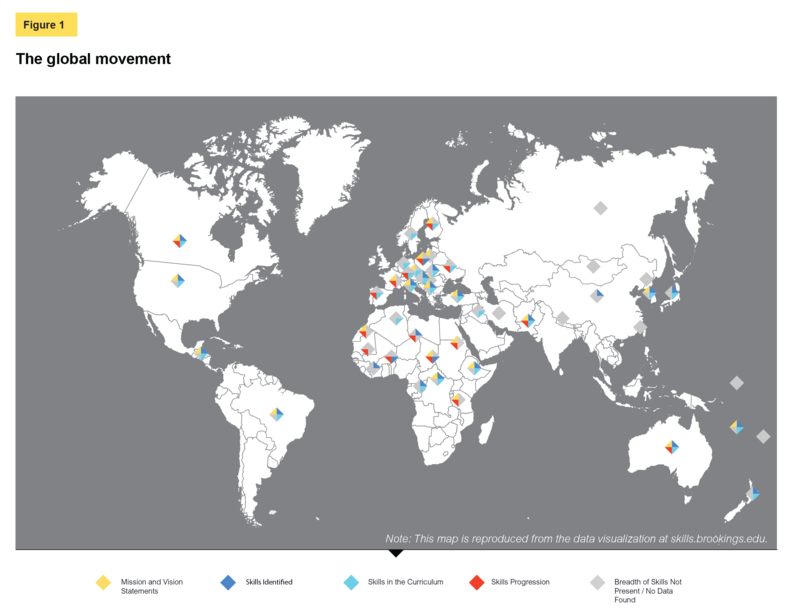 Although there is consistency worldwide in views about the skills and characteristics the youth of today need for the future, countries vary greatly in implementing new approaches to education. In addition, specific country conditions influence stakeholder perceptions of how education systems are responding and providing for future generations. In this report, we briefly review the evidence about the impact of the breadth of skills phenomenon on one of these—the curriculum—through a mapping visualization. Every country is at a different stage of evolution in its education development, and implementation of its education system varies not only according to substantive education issues but also according to national pressures and imperatives. Our interest in the Skills for a Changing World country-level work is on how the interdependent functions of curriculum, assessment, and pedagogy are drawn on to promote breadth of skills. Each function needs to act in a complementary way to provide children with the opportunity to learn. In this report, we briefly review the evidence about the impact of the breadth of skills phenomenon on one of these—the curriculum—through a mapping visualization. We ask about the integration of breadth of skills through the layers of vision statements and curriculum documentation. Then, we discuss survey data that reflect the context in which education takes place and draw on the conceptualization of the learning environment presented in the Skills for a Changing World report How Education Systems Approach Breadth of Skills (Care and Anderson, 2016). The survey data provide pictures of the contexts upon which the educational visions will affect. National education mission or vision statements. The specific competencies or skills identified by the mission statements. Evidence of integration of skills in curriculum documents. Evidence of assumptions about skills progressing in sophistication. Specific skills were cited somewhere in the online documentation of about 86 percent of the countries. For example, skills were mentioned in about 40 percent of the countries’ vision or mission statements and in about 55 percent of their curriculum documents. In addition, around 12 percent of the countries cited progression of these skills across multiple age groups and subjects. This suggests that countries are recognizing the importance of breadth of skills, at least in terms of aspirational statements reflected in policy documents. However, only a few countries are consistently identifying skills at both policy and practice levels. Practice levels would include, for example, details about how skills might be integrated within the curriculum, as well as an outline of curricula that might take the form of a description of how skills might be acquired and progress from simple to more sophisticated forms. The association between incorporation of “skills in curriculum” and identification of “skills progression” is seen as the strongest evidence of integration of this learning and teaching perspective into education. In terms of identifying possible patterns in a country’s interest in skills, presence across all four categories of information is hypothesized to demonstrate a comprehensive approach to planning and might be seen as indicative of progress in implementation of a skills shift in education. For this reason, the pattern of findings within countries is of interest. Notwithstanding that the categories of information could be identified across the countries, the style and depth of that information varied widely. Countries variously identified their aspirations as mission or vision statements, for example. 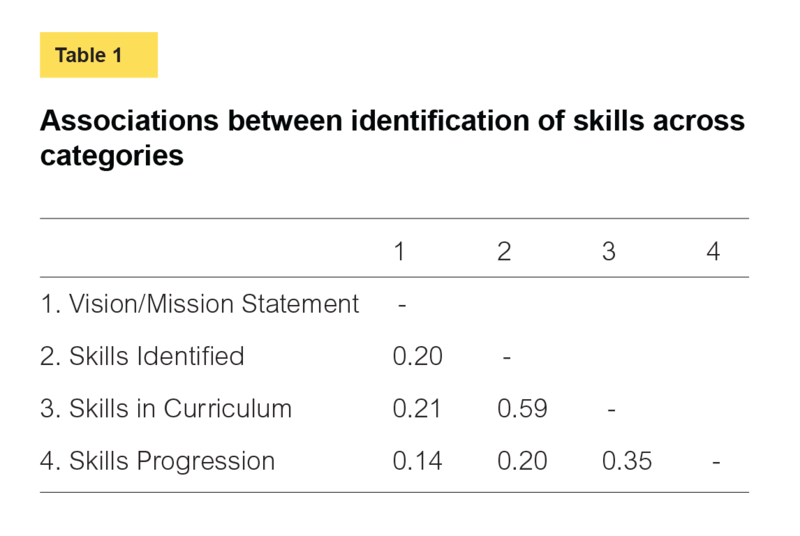 For the “skills identified” category, there were differences in specificity of identification of the skills. For “skills in the curriculum,” some countries provide detail across elementary and secondary education, while others mention skills within and across particular subject areas. For “skills progression,” some countries provide acknowledgment of the fact that skills vary from very basic to proficient while others provide examples of how the skills progress. Associations across the categories were explored. Based on calculation of phi correlation coefficients (Table 1), “skills identified” is positively related to “skills in curriculum” (r = 0.59) and “skills progression” (r = 0.20), and “skills in curriculum” and “skills progression” are positively related (r = 0.35). The association between incorporation of “skills in curriculum” and identification of “skills progression” is seen as the strongest evidence of integration of this learning and teaching perspective into education. Of course, there is obviously a hurdle requirement in that skills must be identified in order to be integrated into curriculum, or to have been considered in terms of natural learning progressions. From an Understanding by Design (Wiggins and McTighe, 2005) perspective, it is a reasonable hypothesis that a nation will identify its overarching educational mission and then track the implications of this backward through more detailed levels of identification, curriculum embedding, and exploration of the nature of the skills themselves, such that their developmental trajectories can be linked with teaching and learning. The pattern across the four categories that would support this hypothesis is that any country that identified a “skills progression” would necessarily have also populated the earlier three categories; that any country that provided information about “skills through the curriculum” would necessarily also have populated the earlier two categories; and that any country that identified “specific skills” would necessarily have a commensurate “vision or mission statement.” The pattern available from the scan at this point is promising, although not sufficient to inform the hypothesis comprehensively. The scan establishes conclusively the ubiquity of the breadth of skills movement through education systems. However, it is very much a work in progress. Many countries do not yet delineate how skills are expected to align with curriculum, nor do they include expectations for how these skills are to develop and mature, in the way they do for traditional subjects. More detail about the scan is available in Care, Anderson, and Kim (2016). The context in which education and, more specifically, curricular change is occurring is both a practical and political consideration for education systems. In the report How Education Systems Approach Breadth of Skills (Care and Anderson, 2016), we described the student learning environment (Figure 2) as one in which the child spends the least time in the most structured learning environment (formal education, such as “the classroom”), and the most time in the least structured environment (society at large). Each student’s learning environments affects his or her understanding of what is important and what is valued; of course, what is important and valued would ideally be reflected through all learning environments. Accordingly, it is important to understand the attitudes and perceptions of those who populate each of the learning environments. To explore this issue, qualitative surveys were undertaken in Mexico, South Africa, Kenya, and the Philippines. Common to the countries is the recent extension of mandated years of formal education (South Africa and the Philippines) or inclusion of a more explicit focus on generic skills beyond the traditional academic ones (Mexico, Kenya, and the Philippines). Each country is at a different stage in the reform, with South Africa recently mandating its “Grade R,” or initial year of schooling; Kenya currently planning its education reform; Mexico announcing inclusion of social-emotional skills for 2017; and the Philippines having introduced its K to 12 reform in 2013. Teachers and parents are key agents in stimulating the development of a broad range of skills in children. Large-scale education reform is led by the formal education system. Therefore, the reform tends to be very visible and can be politically challenging. Where it has immediate economic effects, such as when additional years of schooling become compulsory or even where they merely become available, societal response can have political consequences. Where the reform implies a shift away from traditional academic achievement, those who have benefited from the traditional system in the past might push back against the change, again with political consequences. These are the contexts within which the survey of attitudes and values of stakeholders took place in the four countries. Although a move toward breadth of skills might itself be similar across countries, the individual context of each influences responses to that move. Life is exponentially more complex than it used to be, and thriving in the 21st century requires a wider range of skills than what was regarded as sufficient in the past (Dede, 2007; Kalantzis and Cope, 2008). Considering the societal and economic changes taking place globally, education needs to equip young people with the skills and competencies that will help them succeed (Ananiadou and Claro, 2009; Trilling and Fadel, 2009). These skills go beyond the traditional academic skills of numeracy and literacy to a broader set that includes interpersonal, intrapersonal, and technological skills (Casner-Lotto and Barrington, 2006). Such skills are not new; however, there is a need for mastery of different kinds of knowledge, ranging from facts to complex analyses. Critical thinking and problem solving, for example, have been components of human progress throughout history, from the development of early tools, to agricultural advancements, to the invention of vaccines, to land and sea exploration (Rotherham and Willingham, 2010), but the extent to which these skills are valued and being made explicit is much greater today. Teachers and parents are key agents in stimulating the development of a broad range of skills in children. Teachers’ and parents’ attitudes and perceptions also contribute to children’s interpersonal and academic success (Denham, Bassett, and Zinsser, 2012). At the same time, teachers and parents themselves are influenced by political and historical factors, cultural and community factors, and the physical environment. Therefore, to understand how students can be equipped with a broad range of skills beyond the traditional academic type but within the formal education system, the attitudes and perceptions of key stakeholders from the community to the political level need to be explored. Including those stakeholders might open the doors to understanding attitudes and mindsets toward a broad development of skills. Moreover, examining stakeholders’ attitudes and perceptions across multiple countries can be useful for understanding the different perspectives that countries collectively may have toward development of a breadth of skills. Interviewers and focus group facilitators used a series of probes to explore this question. They queried what types of skills should be enhanced through education and what types are necessary for life success. According to stakeholder group responsibility, associated issues about appropriate strategies for teaching and development of skills were explored. The following country sections are based entirely on the views expressed by study participants. Country context information is provided in order to situate these views. A qualitative research design with a phenomenological strategy of inquiry was employed (Creswell, 2014). Using this strategy, the study contextualized the broad research question within the daily lives of the various stakeholders (e.g., parents, teachers, school administrators, and government officials at provincial/county and national levels) to explore their attitudes toward and perceptions of the development of a broad range of skills among school-age children. Across the four countries, data collection began in July 2016 and finished in December 2016. Two methods of data collection were employed: focus groups and in-depth individual interviews. Focus groups are carefully planned group discussions facilitated by the researcher or a moderator (Peek and Fothergill, 2009). The purpose of this method is to gain understanding of experiences and concepts related to the topic of the research through interactions, and shared or opposing opinions of the participants (Morgan, 1996). Structured in-depth individual interviews involve a process whereby the researcher asks the participants questions about a phenomenon in which they have expertise or insight. This allows the researcher to probe and clarify information in more detail than would be possible in a focus group discussion (Creswell, 2014). Participants for the study were chosen using purposive sampling. Participants from multiple levels of the system, from community members, to teachers, to administrators, to representatives from nongovernmental organizations (NGOs), to policymakers, are included in the study as experts with inside knowledge of the education system of each country. Table 2 shows the number of focus group discussions and individual interviews conducted in each of the four countries. Once the data had been collected through video and audio recordings and transcribed verbatim, the transcripts were uploaded and coded using either a software package for qualitative analysis (Atlas.ti1 in South Africa; NVivo2 in Kenya) or by hand (Mexico and the Philippines). In each country, a multidisciplinary team of at least three researchers, with extensive background in qualitative analysis, educational psychology, or communication sciences, used inductive content analysis to explore the themes that emerged from the data (Creswell, 2014). As transcripts were read, sections of text were first open coded based on the research aims. Then, axial coding was conducted, which involves grouping similar codes together. From this emerged the final themes. Themes were compared and discussed extensively among the researchers until a consensus was reached on the final themes. For each country, a brief history and educational context are provided. Next, themes based on the attitudes and perspectives of different stakeholder groups on the relevance and value of skills, along with other and prevalent themes that emerged, are reported separately for each country. In addition, a summary of the similar and unique themes based on all four countries is provided. Table 3 provides a list of the factors and skills most frequently mentioned by each country. One set of data represents stakeholders’ identification of most important skills and characteristics for children, while the second set represents those skills and characteristics most frequently associated with notions of what it takes to be a successful person.